Sunday May 4th 1884. It was late when the boys came down this morning. Rob was feeling better than yesterday. We all read till dinner time. Col Forney came and stayed till we went to ride about three oclock. We had a delightful ride and made several calls, got back in plenty of time for supper. 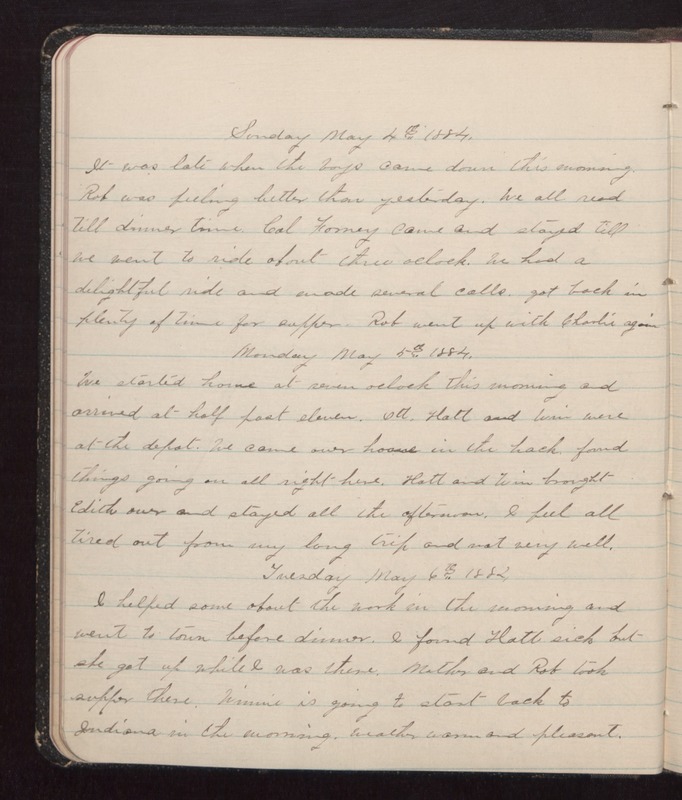 Rob went up with Charlie again Monday May 5th 1884. We started home at seven oclock this morning and arrived at half past eleven. Ott, Hatt and Win were at the depot. We came over house in the hack, found things going on all right here. Hatt and Win brought Edith over and stayed all the afternoon. I feel all tired out from my long trip and not very well. Tuesday May 6th 1884. I helped some about the work in the morning and went to town before dinner. I found Hatt sick but she got up while I was there. Mother and Rob rook supper there. Winnie is going to start back to Indiana in the morning. Weather warm and pleasant.